GlassWorks has the talent and knowledge to place their full concentrate on all of your glass shower enclosure and glass shower door enclosure requirements. GlassWorks is identified as the top company for the most premium shower enclosures and glass shower stalls that our customers come across. That’s is why GlassWorks has been celebrated as the primary glass company and has the best installation experts of architectural glass throughout the Greater Chicago Metropolitan Area and has been since 1997! Regardless of the type of glass shower enclosure you have been looking for, GlassWorks has it and takes pride in our topnotch glass shower enclosures. We’ve been supplying the most extraordinary and award-winning services to the residents of Lincolnshire because of our extensive selection of glass shower enclosures and glass shower stalls. Moreover, we have been serving on average 4,000 customers yearly and we keep growing! Lincolnshire, Illinois is a village that has just under 7,000 residents and it is located in Vernon Township. 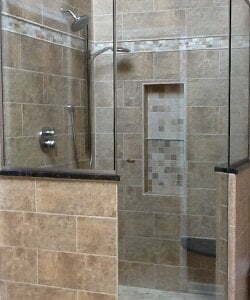 Glenview is the home to GlassWorks so whenever the residents of Lincolnshire are in the market for glass shower enclosures or glass shower stalls, they make the 17 mile trip to GlassWorks. The citizens of Lincolnshire are grateful for our fashionable shower enclosure designs that will also give them a sense of elegance while in their bathroom. Hence, the Lincolnshire residents understand that GlassWorks can tailor their glass shower stall or shower enclosure anyway they desire. Our shower glass is frequently stated to be “safety glass” that can ensure that bathers are sheltered within their reinforced shower glass structure. In addition, your new glass shower enclosure or glass shower stall will turn your bathroom into a getaway retreat! What is more, our loyal clients are constantly relaxed while working work GlassWorks because we can provide them with the most cost-effective and inexpensive costs. Starting from our frameless glass shower doors to neo-angle glass shower doors, glass steam shower enclosures, framed glass shower doors and custom glass shower doors, GlassWorks can work very efficiently and professionally to get any project completed. So, no matter what kind of glass shower stalls and shower enclosures you are in need of, GlassWorks’ installation technicians are always here to help! The specialists at GlassWorks are standing by ready to answer your questions at: (847) 729-5580. To receive a free estimate give us a call or for an appointment, complete our online form for a 10% reduction!